This manuscript contains several works, including a collection of recipes, charms, and surgical operations by John of Arderne; a series of drawings of medicinal plants; and a Middle English translation of a Latin medical treatise. John of Arderne (1307-1376) was the first English surgeon to achieve national and international fame. He attended English troops at various battles in the Hundred Years War, which gave him the exceptional opportunities to treat injuries and to study corpses anatomically. 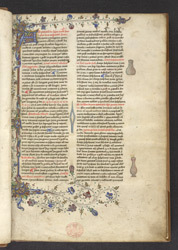 The volume starts with a fine initial and border, and a feature found throughout the text by John of Arderne: marginal coloured drawings which illustrate aspects of the text, such as medical instruments, which cannot easily be described in words.